GRAPEFRUITCRAZY: The Finkler Question - is it any good? I wish I could warm more to Howard Jacobson the novelist. I’ve seen his intelligence and wit dazzle in live debates and he is just as accomplished on television and radio. But I had to abandon his novel The Act of Love, a case of quietus interruptus. I’ve only just got around to buying his follow-up The Finkler Question which I did finish. It must have been a slow year though to have picked up the 2010 Man Booker Prize. It was supposed to be a breakthrough for the comic novel but laughs had been redacted in my copy. 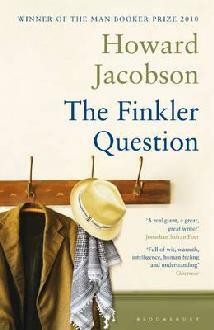 The Finkler Question is really The Jewish Question, you’ll have to read it to find out why. Asking the questions is Julian Treslove, the gentile who thinks his empty existence will be filled by becoming Jewish. He is at once unlikeable and unbelievable. Clearly the book is a great success and I’m in a minority. For me it was boring. The plot thin and the characters thinner; the younger generation was laughable in the wrong way. There were ideas a-plenty though. Jacobson examines grief, loss, family, the nature of friendship. But the main theme of the book is to pick away at what it is to be a Jew in modern Britain. Arguments abound about anti-Semitism both in society at large and that practised by some Jews; pro-Zionism, anti-Zionism; Holocaust deniers; circumcision; even the right quantity of mustard in a salt beef sandwich. But the fundemental Finkler Question – and I speak as a secular Jew – is easily missed in the novel. What is it about our religion, which has as much mumbo-jumbo as any other, that ties us by culture even when, for many, a belief in God has gone? I have about as much in common socially with an ultra-orthodox Jew as the man in the moon. But I have to recognise without those that would rather die than forsake their religion, assimilation in those countries where the Diaspora settled would have been completed centuries ago. There are clues within The Finkler Question. None of the many reviews I’ve read have picked up on the fact the novel, which for the most part is bereft of action, has as its main turning points acts of varying degrees of actual or supposed anti-Semitic violence. Jacobson’s characters – or rather the writer himself – sees sporadic examples of anti-Semitism (whether genuinely inspired by anti-Israeli sentiment or not) as lesser examples sharing the same universe with Nazism. These symbols of persecution keep us in the club. I’ve no doubt Islamophobic insults and outrages go as under-reported in the mainstream media as those against Jews and Jewish property – and act in the same way.